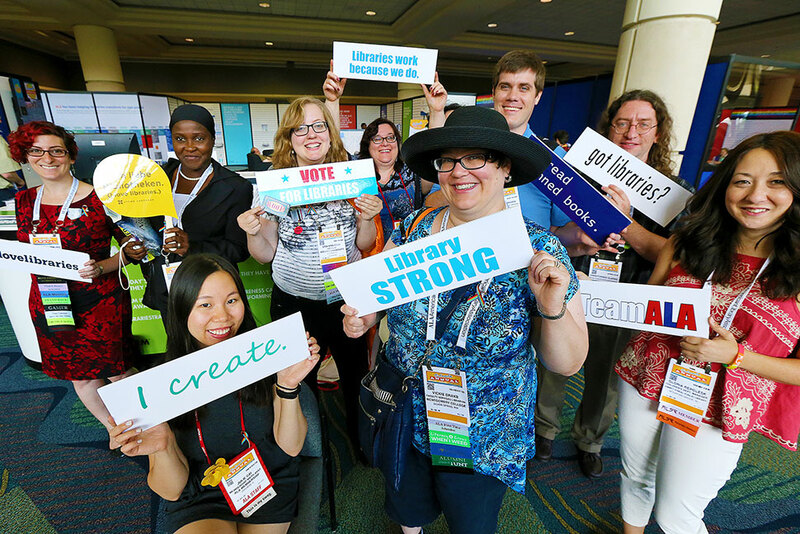 More than 16,000 people attended the American Library Association’s (ALA) Annual Conference and Exhibition in Orlando, Florida, to celebrate the work of libraries and librarians, discuss issues of importance to the profession, and engage in education and networking opportunities. The recent shooting at the Pulse nightclub in Orlando was much on the minds of members and speakers. 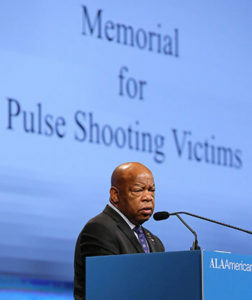 ALA President Sari Feldman and the Gay, Lesbian, Bisexual, and Transgender Round Table both released statements leading up to the conference about how members could support victims and their families and ensure their libraries are safe spaces for all, and a memorial event with an appearance from US Rep. John Lewis (D-Ga.) was held Saturday morning. 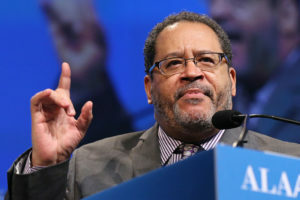 Against this backdrop, professor and political commentator Michael Eric Dyson addressed the timely and critical interconnectivity of hate, terror, religion, and education at the Opening General Session. The conference featured a slate of celebrity speakers who expressed admiration for the services that libraries and librarians provide and the impact librarians have had on their work and lives. Reminiscent of Sonia Manzano’s Auditorium Speaker Series presentation last year, actress and author Holly Robinson Peete spoke to her history with Sesame Street: Her father, Matt Robinson, originated the role of Gordon. “My dad is my inspiration for everything, especially for writing books,” Peete said. Also inspiring her work was her son RJ’s autism diagnosis. “With the reality show For Peete’s Sake on OWN, I wanted to show that you can do reality TV for good,” she said. “We didn’t see anybody else talking about autism, so we knew we had to.” Peete was joined on stage by 18-year-old RJ and his twin sister Ryan to answer questions about their new book, Same But Different: Teen Life on the Autism Express (Scholastic Press, February). In her Auditorium Speaker Series presentation, teen entrepreneur Maya Penn shared how the library shaped both her education and her business. Penn has always been homeschooled, so she goes to the library regularly for learning, but she also uses the library as a resource for marketing, branding, and dealing with customers. Author Margaret Atwood spoke of her relationship to Shakespeare, a nod to her upcoming novel Hag-Seed (Hogarth Press, October), which reimagines The Tempest in modern times. “People have been redoing Shakespeare for a long time, often with odd results, and I too have redone Shakespeare, also with odd results,” she said. She also noted that she enjoys writing unpleasant characters, observing that Shakespeare took as much joy in creating Iago as Imogen. “People who object to works of literature because people in them are not people you would want to marry or have as a roommate are missing the point,” she announced. Children’s author Avi spoke at the American Association of School Librarians (AASL) President’s Program about his childhood with dysgraphia, a learning disorder characterized by poor handwriting, spelling, and grammar. He was criticized constantly for these things, even though he was never told about the condition. A tutor he had at age 16, however, read his stories and told him he was an interesting person and better writing would let other people know that, which changed his motivation for writing. 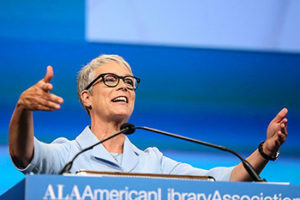 Actress Jamie Lee Curtis’s Closing General Session talk was full of deferential praise for librarians. “You are the gatekeepers; the keepers of the keys of education and words, and you’ve let me in the gate,” she said. She spoke about her struggles in school as a child and how they have driven her to learn more in adulthood and to become a children’s book author. Her latest book, This Is Me: A Story of Who We Are and Where We Came From (Workman Publishing, September), reframes the immigrant and transient experience to allow children to perceive it as an adventure of discovery and introspection. In the book, a teacher tells of her great-grandmother who emigrated from her home country carrying only a small suitcase holding a few belongings. The teacher asks the class which of their own possessions would be so meaningful that they would have to take them on a similar journey. Technology has radically changed student records, adding metadata about login times, social interactions, and even financial information. “That might be nice for adding to well-intentioned educational resources,” said New York University Information Law Institute Research Fellow Elana Zeide, but contract language may allow schools to share that data with commercial vendors not subject to the 1974 Family Educational Rights and Privacy Act restrictions. Three Committee on Legislation (COL) resolutions related to school libraries passed. These resolutions expressed appreciation for congressional champions of school libraries and librarians in the Every Student Succeeds Act (ESSA) (CD#20.5), called for equity for school libraries in ESSA rules (CD#20.6), and called for equity in all school libraries (CD#20.7). Intellectual Freedom Committee (IFC) Chair Pamela R. Klipsch asked Council to defer a resolution (CD#45) on gun violence affecting libraries, library workers, and library patrons, saying that IFC and COL unanimously agreed that it would benefit from further revision and discussion after Annual. After significant discussion, Council voted to defer the resolution. Council also deferred a resolution on the Deaf Culture Digital Library to Midwinter 2017 to allow appropriate research to be conducted. Council approved a FY2017 budgetary ceiling of $65,403,215 (CD#13.3). CD#19.9, on Religion in America: An Interpretation of the Library Bill of Rights. CD#20.4, requesting immediate ratification of the Marrakesh Treaty to facilitate access to published works for people who are blind, visually impaired, or otherwise print disabled. CD#18.2 on the restoration of the United Nations Depository Library System. CD#44 calling for libraries to build more inclusive communities. CD#39 supporting professional cataloging processing and determinations of the Library of Congress. Council received reports from the IFC (CD#19.3–19.8), COL (CD#46), Conference Accessibility Task Force (CD#37), Policy Monitoring Committee (CD#17.1), and the Freedom to Read Foundation (CD#22.1). It read memorials for Ned Vizzini, John Ganly, Naomi Kietzke Young, Orvin Lee Shiflet, Richard Sweeney, Dolores Bullock Owen, Trudy Seidel Jaques, Larry Romans, Charles Weld Robinson, and the victims of the Pulse nightclub shooting. Tributes were passed honoring the 25th anniversaries of the Video Round Table and the Mortenson Center for International Library Programs at the University of Illinois at Urbana-Champaign, and thanking Mary Alice Baish for her service as the 30th Government Publishing Office superintendent of documents. After Council II, all councilors met in the convention center’s lobby for a group photo to mark ALA’s 140th anniversary. Visit our website for more coverage of Annual Conference, including topics such as programming, library design, user experience, and the 2016 Carnegie Medals for Excellence in Fiction and Nonfiction. Be sure to listen to our Annual Conference–themed Dewey Decibel podcast episode beginning July 25. Speaking at the “Student Privacy: The Big Picture on Big Data” session sponsored by the Office of Government Relations and the Office for Intellectual Freedom, Zeide suggested librarians be mindful in adopting new technology and noted that they can put pressure on companies to rein in their data practices. “You have the power of the pocketbook. You must require them to meet your standards of privacy,” she said. The Association for Library Collections and Technical Services hosted a session on the Government Publishing Office’s Federal Information Preservation Network (FIPNet) effort to preserve government information in both tangible and digital formats. The effort, which launched in 2015, welcomes all interested libraries. While many people expect the Library of Congress (LC) to hold everything ever created by the federal government, almost any library collection has “materials that are not held by LC, which is why there is a shared responsibility among federal and other libraries” to maintain a distributed, accessible collection, said Jeanne Drewes, LC’s chief of binding and collections care. Tasks of the FIPNet partners will include cataloging and creating metadata, digitizing and converting content, harvesting web content, hosting digital content, storing physical copies, assessing condition, and conserving and preserving endangered materials. As important as technology is, several sessions made clear that human factors are critical to technology implementations. Effective makerspaces depend more on people and relationships than technology—that was the message from a Friday panel and brainstorming discussion. Heather Moorefield-Lang, assistant professor at the University of South Carolina School of Library and Information Science, observed that while 3D printers are cool, they’re also slow and expensive, and libraries may be able to invest more wisely in smaller projects. She shared her research, which has shown a trend away from broadly focused makerspaces toward themed spaces focusing on fashion, gardening, or engineering topics. The panel suggested finding expertise from the community, rather than confining programming to what the library staff knows. However, Trent Miller, manager of Madison (Wis.) Public Library’s Bubbler makerspace, warned against paying in “exposure,” arguing that if the library doesn’t have funds, it can offer connections with the community in a new way or a free space for projects or exhibits. A Library and Information Technology Association panel on challenges for women in technology leadership featured six speakers from the information technology field. Karen Estlund, associate dean for technology and digital strategies at Penn State University Libraries, recommended several mentoring practices, such as using only last names to refer to interview candidates, making sure ideas are attributed to the women who voice them, and offering training about microaggressions. Challenging the status quo is a valuable practice, noted Brandy McNeil, associate director of technology education and training at New York Public Library. “The biggest thing I did for myself was not be afraid,” she said. Panelists in a Reference and User Services Association session argued in favor of a data-informed approach to readers’ advisory. “We need to do it in a thoughtful way, not a numerical way,” said Barry Trott, special projects director at Williamsburg (Va.) Regional Library. He shared how his library uses a comprehensive intake form to ask patrons looking for reading recommendations the tone, mood, and style they’re interested in reading. 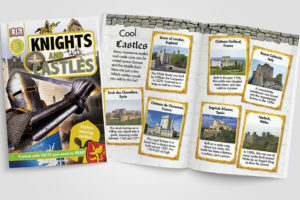 The library has used this information to shape marketing and collection building, improve staff training, and inspire programming. Making services accessible and useful to all people is one of librarianship’s core missions, and many sessions at Annual Conference gave guidance to help librarians effectively fulfill this promise. For example, an Office for Diversity, Literacy, and Outreach Services program highlighted services to incarcerated and newly released adults and their families. Providing these services can be challenging because of restrictive rules at corrections facilities, lack of budget and staffing, and staff burnout. During a two-year residency at Los Angeles Public Library (LAPL), Jacquie Welsh developed the Pathways program, which focused on digital skills and family reunification for people who had been incarcerated. The program helped to provide library cards, books specific to reentry, and brochures and explanations of resources tailored to recently released people. The program doesn’t exist in the same form as when it started, but LAPL is working with the Mayor’s Office of Reentry to continue services to this population. YALSA President Candice Mack’s program featured six speakers discussing successes they’ve had creating inclusive and impactful teen programs. Speakers included Marian Mays, youth services librarian at the Washington Talking Book and Braille Library in Seattle, who used a Teen Tech Week grant to purchase Braille board games and playing cards, tactile games, and audio games; Courtney Saldana, youth services supervising librarian at the Ovitt Family Community Library in Ontario, California, who created the Skills for Teen Parents program to help teach teen mothers practical skills like performing CPR, evaluating a day care, or dressing for a job interview; and Renee McGrath, manager of youth services at Nassau County (N.Y.) Library, who worked with local theater groups to produce sensory-friendly performances at the library for children with autism spectrum disorder. Lisa Kropp, assistant director of Lindenhurst (N.Y.) Memorial Library, delivered an Association for Library Service to Children program on serving tweens in the library. Giving this audience a sense of ownership over their spaces is an important factor. “You’re going to lug out the furniture the way you want it, and the second you have two kids up there, they’re going to move it, and that’s got to be okay,” she said. An internationally focused program hosted by the Social Responsibilities Round Table and Libraries and Archivists with Palestine featured Randa Kamal, director of the library at Al-Quds University in Jerusalem, and Diana Sayej-Naser, director of the library at Birzeit University near Ramallah, speaking about challenges faced by Palestinian libraries. For example, books or journals that “discuss Palestinian culture or the Israeli-Arab conflict are prohibited” by Israeli occupation forces, Kamal said, as are advanced forms of information technology. Additionally, Sayej-Naser said, “There are no library schools available to us, no training courses, and there is a language barrier.” The Palestinian Library and Information Consortium, for which she also serves as coordinator, is focusing on establishing academic libraries as educational centers and developing the professional status of librarians. Budgets are a perpetual concern for libraries. A number of programs featured financial options for libraries, by highlighting either specific programs that provide grants to libraries or strategies to ensure healthy funding from library communities. ESSA has been signed into law, but no appropriations have been made yet. ALA has submitted comments to the US Department of Education throughout the legislative process. 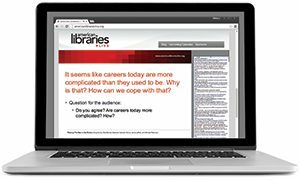 The Washington Office offers talking points that librarians can use and expand upon. 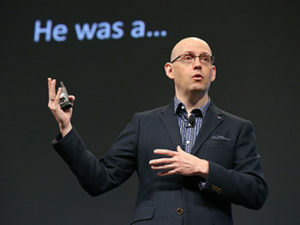 “Nothing is more compelling than a good story, except a good story that’s married to good data,” Sheketoff said. 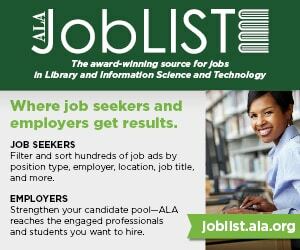 Stephen Parker, legislative director of the Education and Workforce Committee for the National Governors Association, added that public librarians can “make a good case to governors, state educational agencies, and local school boards” about why they should be partnering with state employment agencies. The need for libraries to listen to their communities was the focus of a United for Libraries presentation and panel discussion. Kate Park, executive director of Friends of the Dallas Public Library, shared how the community’s 23 passionate but fractured Friends groups unified in the face of postrecession budget cuts. Park and United for Libraries Executive Director Sally Gardner Reed heard from hundreds of the library’s most passionate advocates to determine the talking points they needed to present to the city council. “We got everyone on message,” Park said. “Because we went through the process together, we had a unified voice, and we were able to listen and unlock the library’s potential.” Then, when it became clear that city council members weren’t familiar with libraries in their districts, the Friends started an education campaign that included taking elected officials on tours of the branch libraries; presenting peer city research; and analyzing population, spending, and employee hours. The campaign was successful. “In 2016, we are in a place where we’re not afraid the library’s budget will be devastated,” Park said. Another SustainRT presentation, by Rebekkah Smith Aldrich, coordinator for library sustainability at the Mid-Hudson Library System in Poughkeepsie, New York, and Matthew Bollerman, director of Hauppauge (N.Y.) Public Library, focused on the triple bottom line of sustainability—making decisions that are environmentally sound, economically feasible, and socially equitable. One key concept, Aldrich said, is the idea that “local supports local.” That’s a sweet spot for libraries, since libraries know their communities and can customize services to fit them—or can ask community members what they need and create allies and increase trust at the same time. Three librarians at the University of Virginia (UVA) in Charlottesville described their Book Traces project, an effort to discover interesting and valuable modifications and marginalia in UVA’s Alderman Library collection of books published before 1923. For example, a copy of Selections from the Prose Writings of Matthew Arnold (1897) that once belonged to former UVA President (and library namesake) Edwin Alderman, contained annotations that “offer a striking window into Alderman’s mind,” said Arts and Humanities Director Christine Ruotolo. The library has 180,000 volumes published before 1923, so it started with a statistical sampling to determine that religion and literature were the subject areas most likely to contain marginalia. Graduate students identified marked books on the shelves. The library developed a form that students could fill out that, in conjunction with the book’s barcode, could transfer metadata into the ILS, although some items did require more granularity. The Library Leadership and Management Association President’s Program featured William Ury, cofounder of Harvard’s Program on Negotiation, speaking about the importance of negotiating skills, particularly with internal audiences like colleagues and family members. “We are negotiating all of our lives, and we may not even think of it as such,” he said, encouraging the audience to turn the process from confrontation into cooperation. He also recommended a process he called “going to the balcony”—finding a place of self-control to relax, think, and determine the action that will best advance your interests. Laurie D. Borman, Amy Carlton, Terra Dankowski, George M. Eberhart, Phil Morehart, Meredith Myers, and Kara Pauley contributed to this report.